Atlas of the Human Planet assesses vulnerabilities to disaster. On behalf of The Human Planet GEO initiative, I’m pleased to announce that the 2017 Atlas of the Human Planet will focus on Global Exposure to Natural Hazards. This years’ edition of the Human Planet Atlas will be released at the 2017 Global Platform for Disaster Risk Reduction, to be held in Cancun from 22 to 26 of May. The Atlas addresses the change in global exposure to six major natural hazards. The findings of the Atlas are derived by processing the global built-up and population grid datasets delivered by the Global Human Settlement Layer project of the Joint Research Centre (JRC). The Human Planet Atlas 2017 and the global human settlement layers will be presented in Side Events and in a dedicated Ignite Talk at the Global Platform. The Human Atlas 2017 is the first global historical assessment of exposure to natural disaster. It measures the changing exposure of related to the built environment and population over time. It addresses earthquakes, tsunamis, volcanos, wind and sea-surge cyclones and floods. The Atlas shows that earthquakes puts more people at risk than any other hazard globally. It is estimated that 2.7 billion people live in seismic areas (2015). This number increased by 93% in 40 years, from 1.4 billion in 1975 to 2.7 billion in 2015. The Atlas reports that in 2015, 414 million people live near one of the 220 most dangerous volcanoes and could be affected by the consequences of eruptions. Tsunamis that affect coastal areas are mostly concentrated in Asia. Japan has by far the highest amount of built-up areas exposed to tsunamis, followed by China, second also per exposed population, and by the United States of America. Floods is the hazard that occurs most frequently and affects 1 billion people worldwide. About 10% of the built-up areas on the Earth are potentially exposed to floods. Asia is the continent that is affected most. Cyclone winds threaten 89 countries in the world. The population exposed to this hazard has increased from 1 billion in 1975 up to 1.6 billion in 2015, that accounts for approximately a quarter of the world population. 640 million people are exposed to extremely strong winds. China is by far the country with the highest number of people potentially exposed to sea-level surge generated by tropical storms: 50 million Chinese people that live in coastal areas may be affected by storm surges and their number has increased 1.5 times in the last 40 years. The Atlas of the Human Planet 2017 relies on exposure data produced by the GHSL project of the JRC. The GHSL was set up to extract global information on human settlements from open source data. GHSL uses a novel spatial-data analytics tools to manage the complexity, heterogeneity and large volume of satellite image archives used to generating information and knowledge about the human presence on the planet Earth from the years 1975 to 2015. GHSL delivers two main information layers, global built-up areas and global population densities. In 2017 the GHSL was awarded the top price at the Geospatial World Forum for having delivered “the most accurate multi-temporal global open and freed data about built-up areas and population for assessing the human presence on the planet”. Martino Pesaresi - Works at the European Commission, Joint Research Center (JRC), contributing to several programs dealing with the use of space technologies for automatic image information retrieval and decision support systems. In 2005-2007 he was the scientific coordinator of the Global Monitoring for Security and Stability (GMOSS) Network of Excellence. From 2007 to 2013, he was the leader of the team "Information Support for Effective and Rapid External Action" (ISFEREA) in the former Global Security and Crisis Management Unit of the JRC, developing remote sensing applications in the areas of post-natural-disaster and post-conflict damage assessment, conflict-related resource monitoring (diamond extraction sites, poppy, coca crops), and risk and exposure mapping. 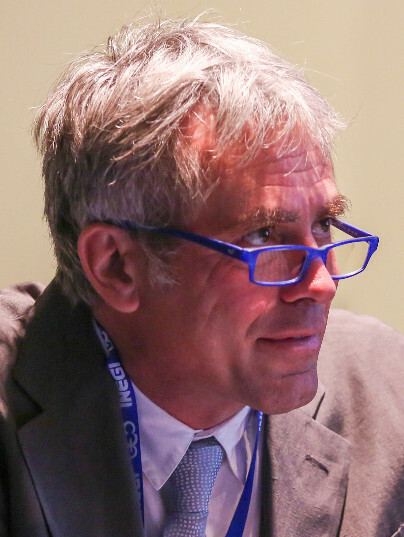 From 2014 to 2016, he was initializing and leading the Global Human Settlement Layer (GHSL) project activities of the JRC, establishing new geospatial analytics technologies for assessing the human presence on the planet supporting post-2015 international frameworks as: Sustainable Development Goals, the Disaster Risk Reduction, and the new Urban Agenda. He is the chair of the "Human Planet" international initiative in the frame of the Group of Earth Observation (GEO) work program 2017-2019.